“Classrooms are a relatively recent innovation, we learn much more and always have done from the world around us and from each other than we necessarily do sitting indoors at desks”. Sir Ken Robinson, education and creativity expert. Naturally classroom environments still have huge purpose and are also wonderful spaces in which to think, learn and grow – particularly when our teachers go to such efforts to transform them into immersive spaces that reflect the thematic learning we offer at Grimsdell. 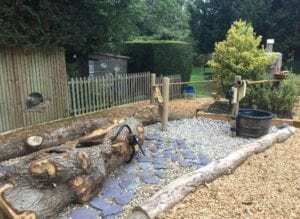 The outdoor learning will not detract from that but rather create enhanced opportunities to utilise the outdoors creatively for learning and give outdoor learning the status it deserves in the education we offer our pupils. With a donation of £100 or more you can add your name to the Grimsdell Giving tree with a personalised leaf and support the Outdoor Learning initiative.